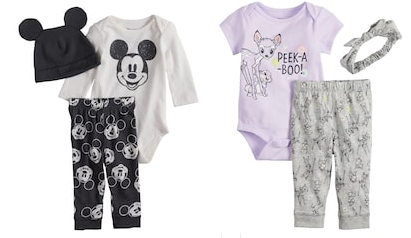 Kohl’s currently has Disney Baby 3-piece Sets on sale for just $9.99 (regularly $22). These sets include a bodysuit, pants and hat or headband. In addition you can use promo code BABYSALE20 to get 20% off baby items and code COLD for an additional 15% off, bringing the price down to just $6.79. If you are a Kohls credit card holder you can use the promo code PINK30 to save 30% off AND code BABYSALE20 to get an additional 20% off baby items. Then use code FEBMVCFREE for free shipping. The final cost will be just $5.59.